Saudi film producer Amr Al Qahtani believes that the Saudi film industry is experiencing new dawn through cinemas opening in Saudi Arabia, liberalization of the entertainment sector, and regulations concerning art being relaxed. He predicts a growing interest and demand for Saudi movies. In this interview, Amr talks about the rapidly changing entertainment sector why the nascent Saudi film industry faces a promising future. Q: With the opening of the entertainment sector in Saudi Arabia, where are your opportunities? AQ: There is definitely support for producers to do more and be more productive by making movies in Saudi Arabia, especially with cinemas opening. I personally work with movies directed to the outside world and that are suitable for international distribution. I don’t do blockbusters but rather intellectual movies that document history for the next generations. Q: Where do you see Saudi cinema compared to other Arab cinemas? AQ: Arab countries are ahead of us in the cinema field; they started a long time before us with production, acting, scriptwriting etc. This field can’t be judged by quantity but quality. I see a lot of work in Saudi and by Saudis that deserve appreciation; it’s fine artwork that has good quality scripts and scenarios which are the essence of a movie. Many Saudi filmmakers have achieved success despite their short experience in the field and lack of support by specialized Saudi institutions. Interest in filmmaking has risen with awareness of the public, the influence, and change that can be created through messages and information that transferred through a Saudi film. In the last decade, there has been a remarkable number of students who went on scholarships to get their degrees in cinema, art, production, etc. This is a good sign for a promising future in the Saudi film industry. Regarding the development of the Saudi film industry in the Kingdom and the GCC, there is a huge diversity; society-wise the region is made of diversified flows of cultures formed into one united society. In addition, they have huge geographical diversity in their countries. Put all these elements together – mentalities, traditions and different nature – it is acreage base for attractive artwork. In my opinion, the support promised and given so far by support governments will build up a successful future for the film industry in the region. Q: What is the role of a producer in film making? AQ: The producer is the maker of a film, this includes all the way from finding an interesting topic to putting together a suitable team, producing, and marketing the work. 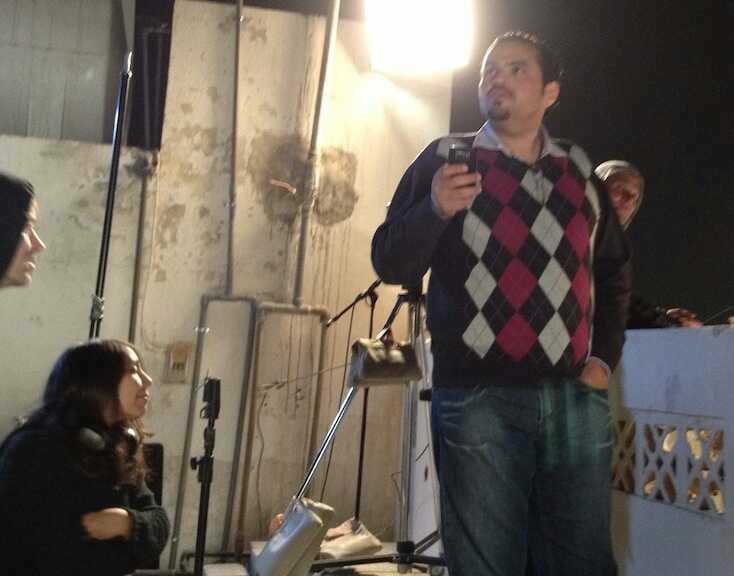 Amr Alkhtani at the set of “Wadjda”, with the director Haifa AlMansour shown on the left. Q: So, what would you say are the main challenges a producer in Saudi Arabia is facing. AQ: In the early Nineties film production in Saudi Arabia was mainly producing TV series, TV ads, and documentaries. This has changed with time and there is much more diversity opening up the market for ideas. What also became easier is shooting scenes. In the past, it was very difficult to do “outside scenes” of a film, as there were many regulations and bureaucratic barriers that a producer had to overcome. Since a few years, regulations have been relaxed and it became easier to obtain a permit for filming these scenes. Relaxing regulations is of big significance as it is gaining status within society which makes it more and more a profession with societal status. Q: How was your beginning with cinema production? AQ: My beginning was in 1997. The father of a friend had an integrated advertisement agency with studios, equipment, etc. One day my friend asked me if I am interested to work with them part-time as they couldn’t find qualified employees. The idea was attractive and I went to work for the agency after my work at a school. At that time, I was working as a music teacher in a public school in Riyad. After spending a year working in the advertisement agency, I decided to resign from my work as a teacher and work fulltime at the agency. One year after my resignation, the agency was dissolved as partners disagreed on finding a mutual vision for the future of the agency. The partners decided to sell the agency and I bought it. Q: What was your first movie? AQ: My first movie production was “Wajda” which was produced in 2012. I was the co-producer with a German company and Saudi Rotana. 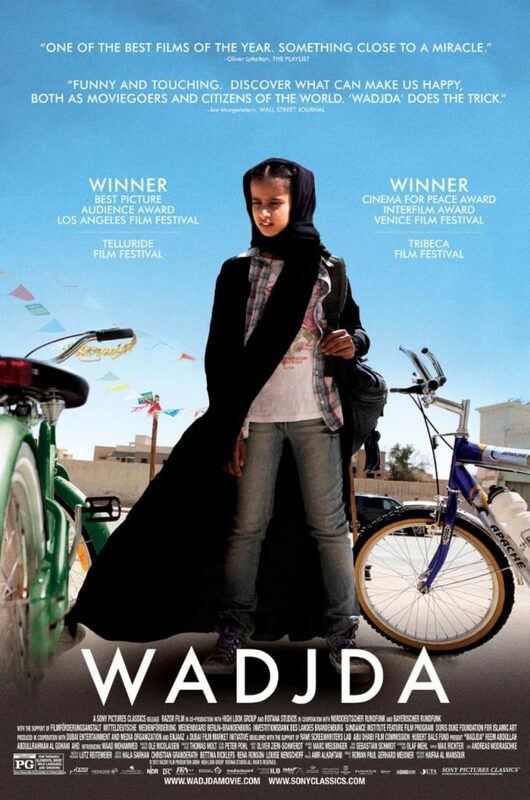 The poster for Alkhtani’s first co-production “Wadjda”. Q: Tell me a bit about how the movie “Wajda“, where did you get the scenario and how did you choose the director and locations for making the movie? AQ: One day I got a phone call from a Saudi director, Haifa Al Mansour. She asked for a meeting to present an idea for a movie. Haifa was the scriptwriter of the movie and also directed the movie. We quickly agreed on the ideas for the movies etc and went on to find with other partners, mainly for financing. For this movie, we traveled around many cities in Saudi Arabia to find the right locations. Q: Another movie you produced is “The Poetess”, one of my favorites. It’s actually a documentary. Was the making of this documentary different than making “Wajda”? AQ: The difference for a documentary is that the script is written after the shooting of the documentary is completed. The director for “The Poetess” is Stephanie Backhaus, a German. We met through a mutual German friend. After a few meetings and discussions, we agreed to do this work together. Hissa Hilal, main character of the documentary “The Poetess”. It tells the real life story of Hissa through the history of Saudi Arabia. Q: How do you pick stories for your movies? And what is the cycle of doing a movie? AQ: It’s very important for a story to have depth and a different dimension away from the artificial and superficial picture that a story may give at first glance. The financial circle of a movie is quite slow i.e. the returns come slowly. A movie passes through different stages, the pre-production period, production and post-production period. After this period comes festivals and cinemas. Although the financial returns can be big the money return comes in very late stages. Q: How do you see the future of Saudi cinema? Including producers, actors, actress, and directors? AQ: Saudi film and Movie production began 20 years ago. There were serious experiences. In this period about 180 productions came out. A lot of them were successful in and outside Saudi Arabia and were nominated for awards at international festivals. There are many filmmakers in Saudi Arabia today. The passion for production swapped over in Saudi very quickly as it became a popular profession with prestigious. A lot of Saudi producers are part of the films making a scene on an international level as well by participating in workshops or asked to write scripts or produce or act, etc. Amr Alkahtani is a Saudi media and PR consultant who lives in Raid and was born in Liverpool, UK in 1972. He got his Bachelor degree in Library and Information from King Saud University, Riad. The beginning of his career was as a library teacher in a Riad boys school. After that, he entered the world of production through several companies in which had a number of tasks of management, coordination, and production for over about 15 years. Amr was a regular columnist for Makkah Newspaper. In addition, he has done lots of projects with many Saudi ministries, planning and organizing events and campaigns. In his career as a producer he produced and wrote 150 documentary films, about 80 commercial films and 10 TV talk shows. His most important movies are “Wadjda” and “The Poetess” in which he was a co-producer.